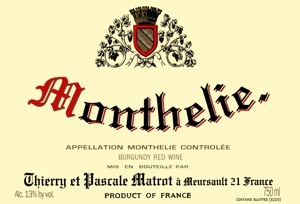 The 55+ year old vines that produce the fruit for "Monthelie" are located in a small Burgundian village called Monthelie, that is situated in-between Meursault and Volnay. The wine is aged in barrel for 11 months in only 10-20% new wood. The color of this wine is very light and completely transparent when held up to the light. It almost looks free run juice to be honest....On the tech sheet provided by the importer Vineyard Brands it does indicate that the wine was "very lightly crushed in order to keep 20-30% of the grapes intact". On the nose I get aromas of cherry, cranberry, tea leaf, rose petal, and hints of chalky soil. There's also faint hints of cola nut and sandalwood which I find quite intriguing. On the palate this wine is quite light in terms of texture, but has an extremely penetrating nature about it. Perhaps it's the beautiful acidity and mineral character the wine contains. I honestly feel like I'm experiencing the vineyard and that this wine has been made in a very minimalistic fashion. There are delicious flavors of cherry, cranberry, tea leaf, and mineral that quite honestly grace the palate. The finish has a soft red plum and cranberry note that lasts for at least 2 minutes....a very long finish. 90 point wines under $20 at Wine.com. Shop Now!